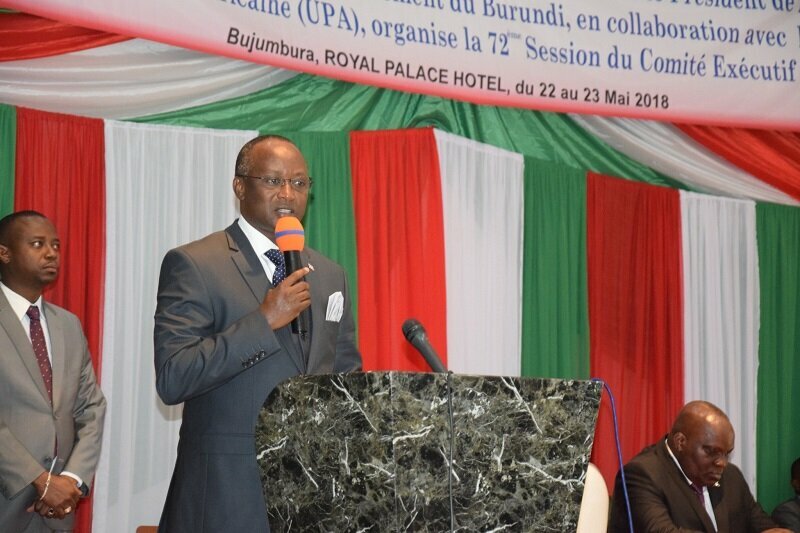 BUJUMBURA May 23rd (ABP) – The 1st Deputy President of the Republic of Burundi, Mr. Gaston Sindimwo, opened on Tuesday May 22, 2018 at the High Technical School located at Kigobe, the work of the 72nd session of the Committee Executive of the African Parliamentary Union (UPA), organized for two days by the Burundian Parliament, in collaboration with the UPA. 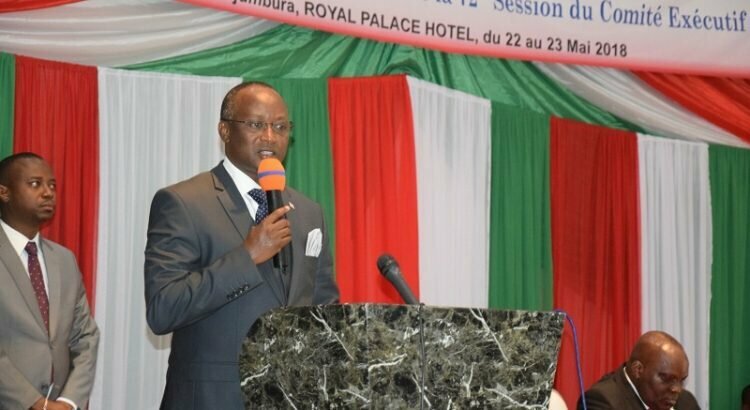 In his welcoming address, the Speaker of the National Assembly of Burundi, Mr. Pascal Nyabenda, thanked all the delegations and the personalities present at the opening of the work of the session. He particularly thanked the Speaker of the executive committee of the UPA and Speaker of the National People’s Assembly of Guinea Bissau, Mr. Cipriano Cassama, who did everything to ensure that the session could be held in Bujumbura. He indicated that the Burundian Parliament is pleased that the National Assembly of Guinea Bissau has resumed normal operation after years of difficulties and that dialogue has triumphed over violence. It is also the dialogue that has just helped the Burundian people to take a new step in the consolidation of democracy by adopting, through the referendum on May 17, 2018, a constitution that meets the current requirements in all sectors, including the integration of Burundi into the East African Community, he added. He is also confident that this dialogue, which is the daily way of life, will lead the Burundian people to free, transparent and peaceful elections in 2020. Mr. Nyabenda expressed his hope that the deliberations, decisions and recommendations resulting from this session, which saw the participation of delegations from 26 countries, will make a positive contribution to the consolidation of the UPA’s objectives. In his speech, the Speaker of the UPA Executive Committee, Mr. Cipriano Cassama, congratulated the Burundian people for holding the referendum in serenity. He assured the solidarity of the African parliamentarians with their Burundian parliamentary brothers and, consequently, with the Burundian people in their effort of reconciliation, peace, security, sovereignty and the strengthening of democracy. Mr. Cassama announced that after the work of this session, he will propose to the Executive Committee to adopt a statement expressing the solidarity of the UPA to the Burundian people. It will be sent to the European Union, the African Union and the United Nations, as has been done for Sudan and Zimbabwe. He welcomed the opportunity given to the parliamentarians who are members of the UPA Executive Committee to hold their session in Bujumbura, and thanked the Parliaments that renewed their mandate last November. This session is taking place as the African continent faces many challenges of peace, security and development, he said, lamenting that there are still many challenges to overcome, even though Africa has, in recent years, made remarkable progress in development, governance and economic growth. Among those challenges, there are terrorist attacks with victims, destruction of infrastructure and others, recalling the need for constant struggle to eradicate them. Added to this challenge are the fight against poverty, endemic diseases, youth unemployment, the migration crisis, climate change, the strengthening of democratic institutions, and the persistence of hotbeds of tension and civil wars. Faced with all these challenges, the UPA, through interparliamentary exchanges, intends to participate in finding solutions for the populations it represents. The participants at the session have to examine the question of implementation of the decisions and recommendations of the UPA of Ouagadougou concerning the enlargement of its members. The chairman of the executive committee of the UPA recalled that they set themselves the goal of bringing together all national parliaments in Africa. During its mission to the headquarters of the UPA in Abidjan in December 2017, the office of the Executive Committee of the Union decided to organize, in the first half of this year, courtesy visits to non-member parliaments and bring them into this community. But for reasons of budgetary constraints, these missions have not yet been carried out. On that occasion, he recalled the statutory obligations of UPA members and urged them to take action in their respective parliaments so that they regularly pay their contributions in order to carry out their activity program. .
Mr. Sindimwo, who had represented the Head of State, was pleased that the “Draft Charter of the Forum of Parliaments of Africa and Latin America” ​​was included in the agenda of this session. One of the fundamental objectives of this project is to promote south-south parliamentary dialogue around issues of common interest. He said that despite the anti-democratic assaults that Burundi has experienced since independence, its people have been able to mobilize and take control of their destiny. He stressed that this session is taking place when Burundi is consolidating its democracy and its assets, despite facing a conspiracy aimed at destabilizing the country and which, after having culminated in the failed coup of May 13, 2015, has continued so far. He noted that the UPA session will be followed by the Common Market for Eastern and Southern Africa (COMESA) summit to be held in Burundi from 1st to 10th June 2018, which shows that contrary to a certain hostile opinion in Burundi that only talks about insecurity, Burundi is open to affairs. According to the 1st Deputy President of the Republic, the most cherished wish of the Burundian people is that the friends of Burundi help it to move towards its development, in the respect of the texts that it has itself set up supremely and democratically. He expressed the hope that members of the UPA delegation will return to their countries as ambassadors for Burundi. The rest of the works has to take place at the Royal Palace Hotel, as reported.